In the past, National Dialogues provided a rare entry-point to organize and conduct political dialogues to address humanitarian concerns. Dialogues were designed to build confidence between the belligerents and with the local population. However, to the dismay of many, the regime in South Sudan is deliberately creating the humanitarian crisis. The brief points to atrocities by the government and an overwhelming national and international consensus that no national dialogue can take place under the patronage of President Salva Kiir and his regime given his track record and direct involvement in spreading the on-going civil war, ethnic cleansing and genocide. 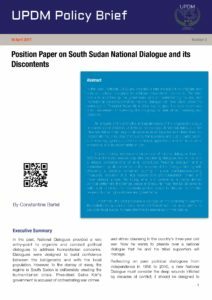 An analysis of the strengths and weaknesses of the proposed dialogue uncovers opportunities to undermine the dialogue. A national dialogue under President Kiir is more likely to fail because what the president offers does not incorporate the principles of inclusion, transparency and public participation, a far-reaching agenda, a credible convener, appropriate and definite rules of procedure, and an implementation plan. It cites the long tradition and experience of national dialogues from the 1950’s and the vital lessons they offer. Importantly dialogues require trust and a shared understanding of what constitutes “national dialogue” and a commitment by all concerned to the success of the Dialogue starting with choosing a credible convener; putting in place confidence-building measures; inclusion of all key stakeholders pre-consultation phase and implementation phase. But today, what is imperative is, a clearly defined political settlement that brings peace and security must first be delivered to build trust to create the necessary political space to discuss the emotive issues of human rights abuses and governance. Furthermore, the brief proposes a dialogue on the economy to examine the realistic policy options that a transitional Government can adopt within the available fiscal space. It draws attention to several recommendations.